We’re live-blogging today’s event in Blaine. Feel free to add your comments. 11:22 a.m. MPR’s Midday is providing a preview of the rally and a look at the strategy behind it. Listen here. 11:23 a.m. Interesting story on Politico about the press that follows the campaign around. What’s the point of having press following everyone in an age of satellite feeds and campaigns that are only about public appearances? 11:25 a.m. – Caption contest! No cliches allowed, but big points for reworked James and Bobby Purify lyrics. 11:31 a.m. — Musings while waiting for the plane to arrive. Dumb controversies of the election for $20. Allegation: Obama removed the American flag on his plane. Fact: No he didn’t. 11:33 a.m. — Question #1: Don Lucia, coach of the Gophers’ hockey team, is taking part in the rally. Should active coaches be involved in politics? What do you think, Mike Tice? 11:37 a.m. – The McMotorcade is near the airport. Why not just fly into the airport? The runway is less than a mile long. A 737-400 needs more than 8,000 feet. Bachmann criticized Obama for “writing his second memoir,” because one was not enough. One wonders if the representative knows that Sen. McCain also has two memoirs to his credit? Still, the Twins are in the middle of a pennant race. Can’t they get any love? 12:04 p.m. Odd shift in focus. She talks about the dangers of Iran nuclear program. It’s actually a shot, though, at Hillary Clinton, who pulled out of a “Stop Iran” rally. But it was organizers who disinvited Palin so it wouldn’t end up a political event, according to the Washington Post. But the appearance that the non-partisan group was aligning with the Republican ticket put the group and its president, Malcolm Hoenlein, under heavy pressure from Jewish Democrats, including members of the conference, members of Congress, and the liberal group J Street, not to give Palin a platform, sources said. Hoenlein told the McCain campaign that he would have to rescind Palin’s invitation or cancel the rally. 12:07 p.m. Palin on the shake-things-up theme. 12:08 p.m. “We’ll never forget we’re there to work for you. It’s about you. I’ve never forgotten who I’m accountable to.” She says she’ll have new responsibilities as VP: government reform, energy independence and special needs kids. Checking to see Palin’s records on special needs children before she had one earlier this year. But it wouldn’t take much to change special needs education in the country. All she had to do is get the administration and Congress to provide the funds for it they’d promised to fund when they made state mandates. It’s been a bipartisan problem. Both parties in Washington have refused to fully fund the mandate. This site says that’s not true. But the ’07 budget provided in the pdf showed it was. However, in the ’08 budget in Alaska, special needs funding was cut and the ’09 budget showed no increase in funding. 12:18 p.m. Sen. McCain now speaking. These are the strongest words yet from McCain tying Obama to the failed Fannie Mae, Freddie Mac, and points out the CEO of one led the Obama VP selection committee. It’s part of a new ad campaign for McCain. 12:25 p.m. Up to fairly recently, McCain’s public speeches have been delivered in a fairly bland manner. He’s much more feisty today, and is much better than even two months ago. He’s been working with a speech coach. The Times noted the same thing the other day. He still rushes to get to the punch lines today… often continuing to speak after the cheers have drowned him out. 12:30 p.m. “You have my word, I will always put my country first,” McCain said. Thousands of “Country First” signs are present. 12:31 p.m. – McCain repeating the story of the woman from Ladysmith, Wisc., who gave him her son’s dogtags. He was killed in Afghanistan. Today he cited Sgt. John Kriesel who gave him his battle coin. Here’s the story of the soldier from Vadnais Heights. 12:34 p.m. – Speech is over, the country music is playing. 12:36 p.m. – In 2004, it seemed, Kerry and Bush matched each other for appearances in the state, one always closely following the other. This year? Maybe, although Obama hasn’t been here since early August. Obama was in Coral Gables, Florida today, and is staying in the state tomorrow. VP candidate Joe Biden seems to be staying in the Atlantic states. According to electoral-vote.com, Obama trails McCain in traditional-Republican Florida by 3 percentage points. And Virginia, where Biden has been working, has also swung red. By contrast, McCain and Palin are, at least this week, working states where Obama has a slight lead. 12:50 p.m. – All in all, I’d have to say the strategy of tying the financial meltdown to Obama was the takeaway from the event. Taking away the obvious (and typical of politicians) attempt to make the connection a little more direct than it actually is, it does raise an interesting question, doesn’t it? Do campaign contributions influence oversight? The other continuing theme that the crowd more than the candidates got into was “drill, baby, drill.” The Wall Street Journal blog had an interesting take yesterday on falling oil prices: oil companies are less likely to invest in exploration if oil prices are dropping. Two subjects worthy of discussion. Thank-you for your radio coverage on 91.1 of the McCain/Palin rally. We were there and it was crowded. We could hear ok, but it was hot and with my three children we decided to head out and listen to it on the radio. I was so glad you had it on. I applaud the McCain/Palin campaign for doing their best in Minnesota. I was actually shocked to hear MPR covering it so well. THANK-YOU! A very proud AMERICAN, Homeschool, Hockey and conservative Mom.. Newer › Are you smarter than a blogger? 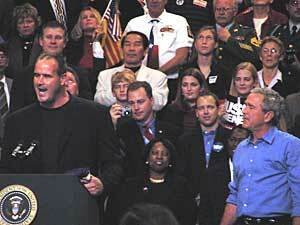 John Gagliardi appeared at Bush rallies in fall 2004 as well. The Trooper-Gate investigation and the link of Sarah Palin to the focus in the family organization. Liberty Legal Institute is the legal arm of the Free Market Foundation, a conservative activist group associated with Dr. James Dobson’s Focus on the Family. They are now involved in the investigation. It has been reported that Palin broke the law by spending $55,000 of road maintenance funds, without the council’s permission. Palin fired Emmons on 1/ 30/1997. The next day she withdrew the firing after an expression of public support for Emmons. After the bridge received sharp criticism from John McCain and other congressional members she backed down. Palins lack of curiosity about the world and international affairs. Ms. Palin first applied for her passport last year. Given McCains health issues and age Ms. Palin could in deed become the President of the United States. Can you say the earth is flat?? The UpTake has live video of the event. What has Palin done to claim such strong national security credentials? Did I miss something? After some shaky memorized lines about Iran’s nucular program, Palin seemed more comfortable with the warmup jokes and with her main talking point about helping special needs kids. However usually this kind of kid-emphasis project is delegated to First Ladies. This woman scares me, I don’t see how any foreign leader can take her seriously. I’d buy Avon from her, but not vote for her for serious office. It’s like the Ketchup couple woman on A Prairie Home Companion running for office. Maybe I need some ketchup with its mellowing agents to calm down. When this over so I can turn my radio back on? I really find it annoying to listen to someone this stupid. It’s like listening to Bush speak. As long as ‘you’ and ‘the rule of law’ aren’t the same things. Um….am I mistaken or wasn’t John McCain one of the senators that helped bring about the deregulation of the industry that many economists think got us into this financial crisis in the first place? So technically speaking, doesn’t that make him one of the forces that brought down the economy? And while we’re at it, how can he keep claiming that he’s going to shake things up? Hasn’t he already had over 20 years to shake things up? What’s the benefit of voting for a party whose greatest claim to fame seems to be that they fight their own corrupt party? If their party is that corrupt, why put them back into office? Can anyone commenting on this blog simply listen to what is said with balance? I appreciate being slanted for Obama but really, to ignore the perspective from the other side simply propagates ignorance. Nobody, whether it be McCain/Palin or Obama/Biden have all the right answers. Why not listen and search for what is best about both sides? Ignorance is not bliss, it quickly crosses over to stupidity. Palin can see Russia from from Alaska, what more do you need for credentials? Hey Bob, where does this put on the we matter index? Are there any more appearances scheduled in the near future at this point? What did Palin do? She jacked up the already confiscatory production tax even higher causing a 16.5% decline in production since she took office. She also signed a deal to export 100% of Alaskan natural gas to Canada instead of building a pipeline to the United States. Any word on a Mass Exodus from the rally after McCain started speaking, as happened in Cedar Rapids, Iowa the other day? Andrew, I think there is usually little of substance said at any political rally, either democratic or republican. They are made for soundbites. I don’t think is it the listener’s fault for wanting to point out the BS, even if there are tidbits of good points within it. It’s like an echo chamber with you people…Honestly, I don’t see how you can question Palin’s experiential credits on one hand and then turn around and enthusiastically support Obama – a man who gives new meaning to the term “Green” candidate. Let’s be honest, they have very comparable experience, the only difference is that Palin wouldn’t be running the country and Barack, frighteningly, would. Now that we’re clear on that, all you government employees better stop wasting my tax dollars and get back to work! I’m trying, I really am, but when neither McCain or Palin say anything of substance (other than to comment about the local hockey teams) it’s hard to dig out much worthwhile content, unless her platform is to build hockey rinks in every city of this country. I’d support that as long as tax payers don’t have to pay for it. Then the best comment to make on this blog or any other is none at all. People should be sharp enough to recognize the sound bit aspect. It doesn’t need to be pointed out does it. That is not only taking the horse to water but sticking its head in to make it drink! The problem identified in the majority of the comments here and in the traditional news formats is that people focus on the bitter dividing pieces of information, whether factual or not. Obviously the media are simply playing to their “paying” constituencies but there is a point where people need to think for themselves and realize what is real and what is not. They need to quit tearing apart and working to build up. Sure this might be a panacea but current approach clearly does not work. Even here at MPR. I do have to agree, McCain speech skills have improved compared to recently. He did sound much better today and much more enthusiatic than normal. Andrew, what about the people that aren’t smart enough to pick up on the soundbites? Or that don’t care enough to find out what is right and what is wrong? Doesn’t someone need to point out when the candidates are being less than frank with the American people? Granted, this blog may not be the best place to find those kind of people. Marcus, picking apart Palin doesn’t mean you enthusiastically support Obama. None of us can overcome the ignorance of others. Certainly it is good for there to be news that reduces down the speeches and proclamations to their base points. The challenge with this is in how it is conveyed to you, me and everyone else. When bias comes into play it is incredibly dangerous for us as an American public. Unfortunately, from the business perspective, many media outlets do not seem to realize how dangerous it is to their business model. The exception to this are outlets like Fox news and Rush Limbaugh. That all said, to address your point about those who “don’t care enough to find out what is right and what is wrong”, they simply should either 1) become educated enough to make informed comments or 2) be silent, after all it is a virtue. That Wall Street Journal article is very interesting. So if drilling projects rely on higher oil prices in order for gas companies to consider them feasible, would drilling really significantly help to drop those prices or would they need to maintain the oil prices at the same general level in order to maintain the project? Have there been any studies done on what the projected impact drilling would have on gas prices? If so, what did they find? Was it a significant drop or no? Just a quick comment on the thread which seems to be departing from a discussion of the various points I brought up to one on the way media covers elections. THIS particular area is a BLOG, it is not a news story. People have a choice to just listen to the speech and ignore everything else and certainly MPR gives it to you as do a lot of other places. News Cut is *my* take on the day’s news, I tend to look at things in different ways and poke at assumptions. And *I* tend to encourage dialogue and discussion. The other purpose of a blog is to provide links to additional information that may provide more context to the candidate speeches and claims. Andrew, your point about dividing piecesof information is well taken, but I don’t feel it applies. People are trying to define and highlight the differences between candidates, so dividing pieces of information IS how that is done. Of much greater concern — historically, for me anyway — isn’t so much how we do that BEFORE election Day — it’s that we continue to do it AFTER Election Day. Are you saying that they have realized that being biased pays, or that they are the only un-biased news sources? I actually think your questions are more interesting, just harder to post on than accusations of bias. I think if it were earlier in the election cycle the candidates would have more incentive to change their stances on oil policy. Right now it pays to be either “Drill Baby, Drill” or “Don’t drill at all.” The election will likely come before reports on why both options are wrong will have time to sink in. It is too risky to be labled a flip-floper. Thanks for your live blog, Bob, your reaction and the questions you raised. This is one of the reasons why I love Minnesota Public Radio. I think we should have a bi-partison commission that judges ad and speech claims both on what the candidate has done and what they say the other candidates have not done. The commission awards points for wrong statements. For evey 10,000 points you get, your side loses one electoral vote. We will let Bob run the commission and vote in case of a tie. This whole election is beginning to sound like carny barkers at the fair. They say whatever you want to hear so that you will spend your money. Andrew, what about the people that aren’t smart enough to pick up on the soundbites? As delightful as Mill’s statement it …. he was English, and the Conservatives in this case are the Conservative Party in England, not those who are just ‘conservative’ in their opinions. The Conservatives are, however, indeed the British “Right”, a la Margaret Thatcher & John Major. John Stewart Mill provides a great interest in reading for philosophical views on government and society which should appeal greatly to most Americans today. Cut and paste this and listen to a recent interview with McCain about South America, Cuba and Spain.. and explain how Mexico ended up in McCain’s response to the question: Would you invite the president of Spain to meet with you in the White House? It’s towards the end of the interview during which all of the questions are answered with the same canned material, reworked just abit. My concern??? the man is getting tired. Yes, campaigning is grueling couldn’t handle it and I’m 20 years younger, but leading our nation is even more so which really is a concern. Perhaps he thought no one in the U.S. would listen to this one??? As to McCain criticizing Obama for accepting contributions from Freddie Mac and Fannie Mae; up till a week ago they were venerable quasi-private entities and are alowed to contribute like most corporations, so there’s no foul in accepting their contributions. But to criticize one’s opponent for taking them when, with 7-9 homes, McCain probably took benefits from those same corporations is immoral.